Luke stops by to see Sonny, looking for an apology for Sonny’s involvement in the intervention. Sonny explains Luke’s kids came to him for help. They still need Luke, even as adults. Sonny mentions Dante’s proposal to Lulu, which Luke says he’s aware of, but thinks it will be a big disaster. Luke feels Lulu doesn’t want to marry Dante, because he claims to know her mind. Sonny says they love each other and wonders if Luke would have done things differently with Laura if he’d known what he does now. Luke feels Laura wouldn’t have been as hurt as she was, but can’t change the past. 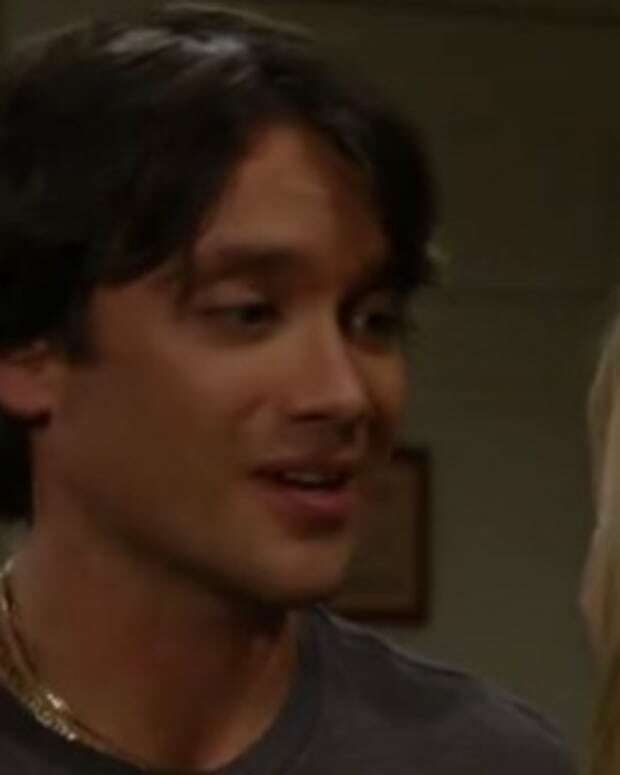 Luke mentions Brenda and that he heard Sonny got crazy after Brenda left. He wonders if Sonny is taking his meds. Sonny mentions Luke’s kids. Luke says he has a grandson, Aiden. Sonny tells him to give a damn and care, because if he doesn’t have a relationship with his grandson, Aiden will feel unloved. Sonny wonders if he’ll need to hunt Luke down when it comes time to walk Lulu down the aisle or pay for the wedding. Luke tells him if he marries Kate, to remember how the others turned out. Dante stops by Liz’s, where Lulu is babysitting. He lets her know he’s taken on a case. Lulu’s angry he’s back to work after only 24 hours out of the hospital, when he’s entitled to 26 weeks of disability. Dante explains he’s on Lisa’s case and is trying to protect his mother, who’s a suspect. He says she had to know he would go back to work. Lulu thinks he just jumped on the first case that came along and that he’s not strong enough to chase suspects. Dante says it’s all people they know. Lulu doesn’t believe Olivia’s capable of murder and says to let the cops find the killer and sit this one out. Dante tells her he’s always waiting. Waiting for her to wear the ring, tell people they’re engaged, discuss the wedding and his patience is wearing thin. Lulu spots a bruise on Aiden’s arm and points it out. Dante wants to move ahead with the wedding plans, but she’s still not happy about his case. He tells her he told her right away and didn’t keep it a secret, but she points out that he told her after he’d made the decision. She wants him to go home and rest, but he doesn’t. Mac wants to ask more questions. Robin says she’s not sorry that Lisa is dead and maybe it wasn’t murder. Maybe Lisa fell out of the boat trying to get away. Mac assures her Lisa was dead before hitting the water and was hit with a weapon. Robin points out the killer could have disposed of the weapon, but also flashes on the wrench. Robin tells Mac she and Patrick are going away for a few days. He wonders what she isn’t telling him. Robin swears she’s told Mac everything she knows and doesn’t want to relive the events. She doesn’t appreciate her uncle treating her like a suspect. Olivia questions Steve’s past relationship with Maggie. At first he says they were friends. Then he admits they dated. Steven assures her it’s nothing to worry about, he’s not going anywhere, especially now. She wonders what he means by that, but he changes the subject and heads out. Liz clings to Jason, saying she can hear Jake calling her and that she has no one else to help her. Monica orders Matt to push more fluids. Liz continues to ask Jason if Jake is ok and asks him to call home and tell him she’ll be there soon. She begs Jason not to leave her. Lucky sleeps, while Siobhan talks to him about coming to Ireland. She tells him he has to listen to Jake, who has more to tell him. She makes the window slam shut, which wakes up Lucky. Lucky finds Siobhan’s red hat. Later he tells the inn keeper that he’s going back to churchyard for more messages. Kate wonders why Johnny’s waiting for her outside of Kelly’s. He jokes he’s waiting for her to thank him for fixing her car. She reminds him he actually accomplished nothing. She says she has no patience for fools or gangsters trying to get to Sonny. Johnny admires her for reinventing herself and then wonders why she wants to throw it away for Sonny. Kate knows Johnny wants to cause trouble for Sonny. Johnny says Sonny loves his misery and inflicts it on everyone else around him. He reminds her Sonny married another woman instead of her and says Sonny loved her, but married Claudia for a piece of the Zacchara organization. Kate points out everything is about Claudia and thinks he should let Claudia rest in peace. She says she left Sonny all those years ago and if she hadn’t he might have been a different man, not the one Johnny despises. She tells him he should blame her. Johnny tells her not to feel guilty for Sonny’s life, Sonny is addicted to power. She should save herself. Johnny tells her to call him if she ever needs a friend or a favor. Liz’s fever breaks. Matt tells her they were worried about her. Liz wonders about Jason’s honeymoon, but he says they just got back. Liz explain she had crazy dreams that Jake was alive and is upset about all the people she’s lost. As Jason and Monica head out, Monica commiserates about how it couldn’t have been easy for him to hear about Jake. He explains that Jake will always be part of his life, even in memory. Monica is sure he’s excited to start his life with Sam and assures him that he can come to her anytime he needs to talk. They share a hug. Robin catches Maggie being cute with a young patient and introduces herself as chief of staff. Maggie talks about the patient and Robin asks her to leave. Steve introduces Maggie as the new pediatrician. Robin apologizes, re-introduces herself and tells her to fill out the paperwork before treating patients. Delores tries to question Steve, who busy checking up on Liz. Matt assures him Liz is back on track. Liz asks about the boys, thanking Steve for his help. She knows it must be difficult for him, since he has no kids of his own. Steve wonders if she’s heard from Lucky yet. He will be ready to deal with him when he returns. Mac questions Matt, who admits to being passed out the entire time Lisa was on her rampage. Mac wonders if anyone can confirm that. Robin assures Patrick that there’s no way Matt could have killed Lisa. Patrick figures whoever did it must be scared. Olivia’s upset Delores is asking her questions, since she doesn’t know how Lisa died. She explains how she and Steve found the broken engine and were trying to fix it. Delores snarks that Steven can fix a boat engine. Olivia puts her in her place, saying she was the one trying to fix it. Delores asks about tools, but Dante interrupts, saying she’s badgering his mother and a lawyer should be present. Delores says it’s not an official statement and snarks at him about Sonny before heading off. Lulu’s chit chatting with Aiden, when Luke shows up at the door. Back at the churchyard, Lucky asks Jake to forgive him for not protecting or saving him. When Lucky wakes up, Aiden’s name has been added to his message.